Do you know you the point beyond which you are unable to produce a desired or intended result? There’s a point when we don’t have enough energy to focus due to not enough food or sleep. There’s a level of alcohol past which we lose the ability to maintain control of our actions. There’s point where our focus is undone with distraction or too much information. We have these point throughout our daily affairs but we often ignore them running the risk of failure, pain and suffering. Running past these points can certainly help us expand our capabilities provided we learn from our experiences. Being aware of these points and knowing when we approach them can help us manage our business. For example, how many of us work past our time to go home? Does it make a difference in the long run? Certainly, short bursts of effort can help achieve specific goals. However, considering the long-term consequences working past our boundaries negatively impacts our lives and the lives around us. When this behavior becomes the standard, the whole team becomes less effective. I had a recent meeting with a customer scheduled from 8am to 5pm. I scheduled picking up my kids around this schedule and did not set up the situation so my spouse could pick up the kids. The people running the meeting did not manage the presentation or time and it went over. How many meetings do that! I left at 5pm as I didn’t want to absorb the dollar a minute threat from the daycare providers. The meeting went an extra two hours with the customer. There was a post meeting tag up for the team to discuss what the concerns the customer brought up. Instead of respecting the time and commitment made by the people in the meeting and scheduling something for the next working day, they just pushed on. Instead of recognizing the potential of the meeting running over and planning ahead for a contingent meeting to finish they assumed people would allow the meeting to go longer and commit more time than initially expected. Is this being accountable to the schedule set up? Is it respectful of the customer or the people on the team? Is it good planning? Is it good communication? 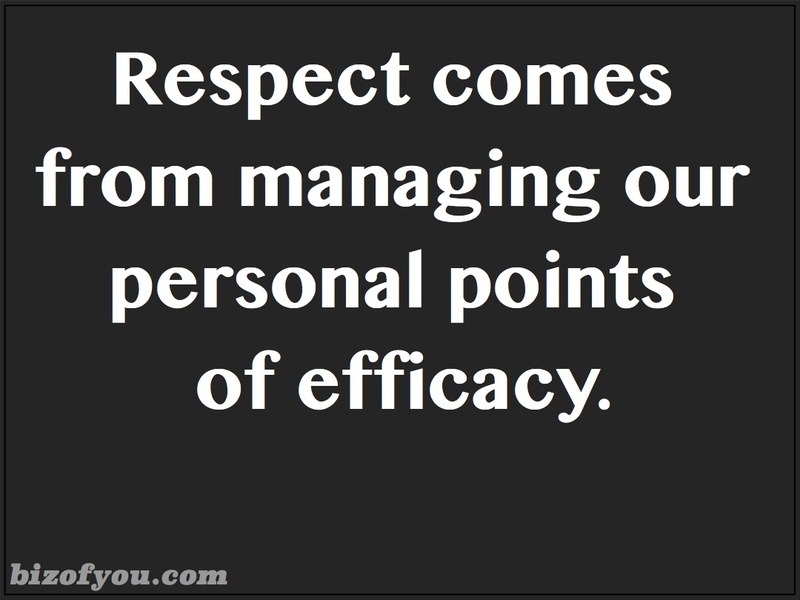 Relative to the biz of you, do you know your personal points of efficacy? Perhaps you lose the ability to focus after 9 hours of work. Perhaps you lose stamina after 2 hours and need a break. The key is to know thyself and how you make things happen. Do you manage yourself around those points? Do you hold yourself accountable to your own desired results? Perhaps if we did this individually, our accountability would spread to those we interact with. People would trust us more. Being accountable sets expectations of success. It empowers us and those we interact with. Respecting ourselves creates respect from others. In time we can begin to change our environment for the better if we simply manage our personal points of efficacy.